A Penrith-based business is set to take advantage of a program that aims to export quality Australian goods and services to Asia. 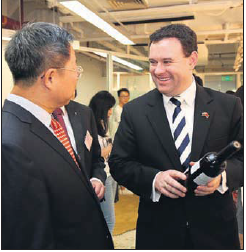 Nova Spring Water joined Australian soccer great Tim Cahill and NSW Minister for Trade and Penrith MP, Stuart Ayres, in marking the official launch of the NSW Business Chamber’s Export Growth China program at a gala event in Shanghai last week. The Chamber’s groundbreaking Export Growth China program showcases Australia’s best goods and services to Chinese wholesale buyers and distributors in a purpose-built showroom located in ShanghaiMart, the largest permanent trade centre in Asia. Nova Spring Water bottles pure spring water from the Central Coast Highlands of NSW which has been processed through a five-stage filtration process, and is one of 65 Australian businesses taking part inthe program to achieve export success in China.